No I do not work for CB2, but I am prepared to sound like an infomercial anyway. 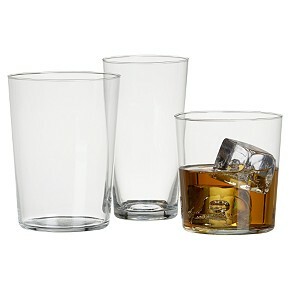 There, you can find the incredible “Marta” glassware made from super thin and durable beaker glass. Why should you care? It’s multi-functional, appropriate for anything from wine to an Old Fashioned, and, at around $2.00 a glass, you can afford to have more than four. (You know who you are, cheap friends, who make us drink out of coffee mugs when you run out of real glasses.) Also I recently discovered that your drunk “friends” can drop them on your cement rooftop and, not only do they not break, but they bounce. For another $6.00, buy the beaker pitcher too. Think sangria, bloody Marys, mojitos for your next boozathon. This entry was posted on September 14, 2008 at 10:20 pm and is filed under Uncategorized. You can follow any responses to this entry through the RSS 2.0 feed. You can leave a response, or trackback from your own site.